Jay Baruchel hates Los Angeles. But he’s going to visit his friend, Seth Rogen. Seth talks Jay into going to a party at James Franco’s new house, even though Jay doesn’t really know or like anyone that will be attending. During the party, Jay and Seth head to a convenience store to get cigarettes. That is when all hell breaks loose. Literally. Beams of blue light shoot down from the sky, sucking people from the streets. There are explosions and earthquakes. Jay and Seth run back to Franco’s, where no one is aware of what has just happened. As the entire party runs outside to see what is going on, a sinkhole opens in front of the house. Most of the party falls to their death. The only ones who survive the party are James Franco, Jay, Seth, Jonah Hill, and Craig Robinson. They board up the house and try to ration what supplies they have left so they can survive until they are rescued. Written and directed by Seth Rogen and Evan Goldberg, I had my doubts about the quality of this film. From the previews, it looked like it would basically be Seth and his buddies hanging out at the end of the world. It had the potential to be funny. But usually, the execution of these films fall miserably short of what they could be. After seeing the movie, I can say that I was right. It was Seth and his buddies hanging out at the end of the world. I was wrong about everything else. There is no acting to speak of. It literally is Seth, Jay, Jonah, Franco, etc. being themselves. And it is exactly how I would expect they would behave in this situation. At one point, while they are holed up, they decide to make a sequel to Pineapple Express using the prop camera from 127 Hours. They are making it up as they go along, based on a premise that Seth and Franco came up with. That’s pretty much how This Is the End feels. And it works beautifully. It is so much better than “buddy” comedies from the likes of Adam Sandler and others. The cast includes a virtual “who’s who” of the younger generation of comedy actors. Aside from those already mentioned, you have Danny McBride, Martin Starr, Michael Cera (funnier than I’ve ever seen him), Christopher Mintz-Plasse, Mindy Kaling, David Krumholtz, Paul Rudd, Jason Segel, Aziz Ansari, and too many others to mention. Most of their screen time is short-lived, but their interactions at the beginning are hilarious. The concept of the movie, which I won’t give too many details so you can experience it for yourself, along with some of the effects are ridiculous. And that’s fine. If you like Seth/Franco films, you’ve come to expect this. It lets you know that the film isn’t trying to take itself seriously at all. How could you take this film seriously? I must say, this is undoubtedly one of the funniest movies I have ever seen. It is a crude, vulgar, disturbing, inane comedy that could only come from the mind of someone like Seth Rogen. I loved it. The only time I stopped laughing was when I was trying to catch my breath. It’s nonstop from beginning to end. It was so well done, I was surprised to find out that it was 2 hours long. There are some who won’t like this film or find it funny at all. Those who don’t like Seth Rogen and James Franco (Although, I beg you to give this one a chance. It is better than anything else they have done together). Those who don’t appreciate crude, vulgar movies. My mom. 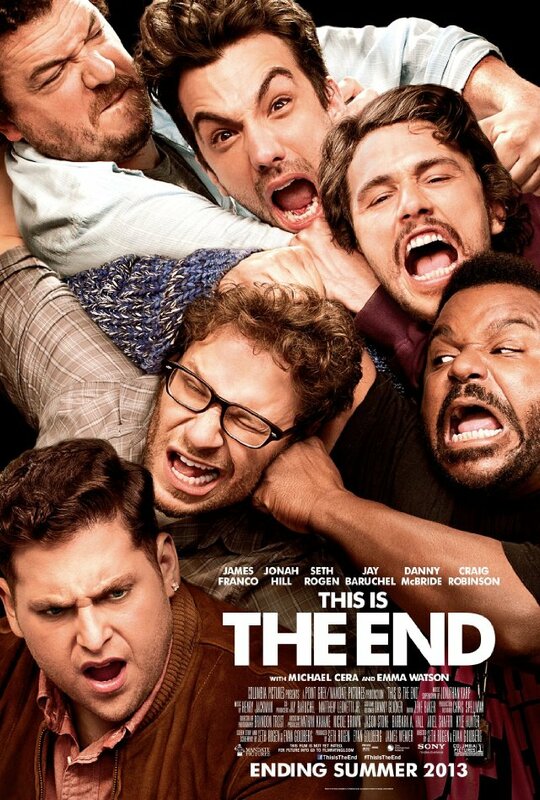 Everyone else, you will definitely want to see This Is the End. You won’t be disappointed.